PlaySight tennis legends Novak Djokovic and Billie Jean King join world-class investors including Bill Ackman, Mark Ein and others to support the growth of fast-growing and affordable tracking technology for all levels of tennis players and a variety of ball sports. The new capital will fund a global roll-out of PlaySight’s SmartCourt technology for recreational and elite tennis, as well as research and development on applications in other popular sports beyond tennis. The Company plans to apply their affordable technology to basketball, soccer, hockey, baseball and other fields of sports with the same SmartCourt concept. *Some features will require upgrading your user account. Gordon A.Uehling III – Former ATP ranked tennis player, coach and founder of CourtSense – the first “SmartClub” in the world which all his courts are equipped with “SmartCourts”. James Kern – Veteran Wall Street Executive with over 2 decades of Capital Markets expertise. James will be joining PlaySight’s Board of Directors. Based on concepts originally designed to train fighter pilots, PlaySight‘s SmartCourt is an affordable, proprietary technology that is easily installed at tennis facilities and private courts. The SmartCourt provides players with professional real time (and post session) match statistics, analytics, line-calling and video. 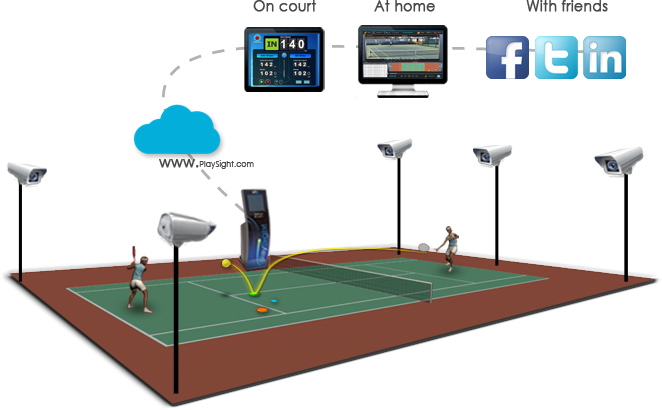 SmartCourt’s combined capabilities dramatically enhance the tennis-playing experience and greatly improve training and coaching efficiency. Using five HD cameras, PlaySight’s SmartCourt automatically classifies and tags all the events that take place during a session without the need for court-side operators or wearable sensors. Players can watch selected events (e.g. every backhand down the line that went long), with no need to watch the whole video or manually tag it. PlaySight is also able to record 3D tactical game management information including the height of balls over the net, speed of every shot and the depth of balls hit within the court. The SmartCourt is easily operated by the players through a courtside kiosk and all video and data can be shared within seconds with coaches, friends and family at remote locations. Players can also track distance covered and calories burned during a match or practice session. Already approved by the International Tennis Federation (ITF) for use in amateur tournaments, PlaySight’s SmartCourt technology is already installed at a number of prestige venues including Roland Garros in Paris (home of the French Tennis Federation), CourtSense Tennis Training Center in New Jersey, Queens Club in London, Stefan Edberg’s academy in Sweden, Holland’s Laurense Tennis Academy (the training center for legendary coach Sven Groeneveld) and Ramat Hasharon tennis center in Israel. 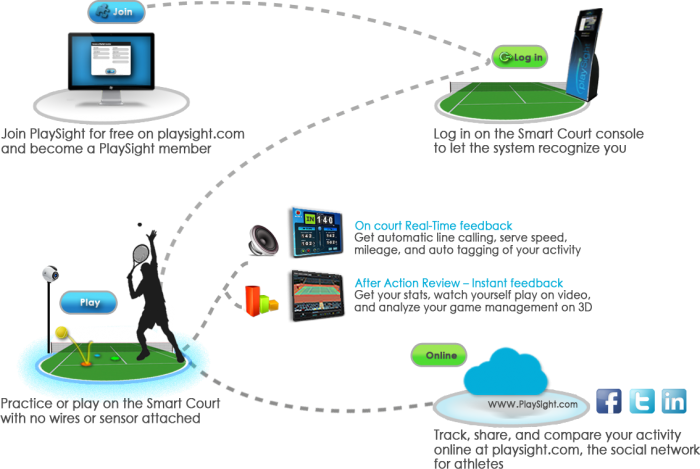 PlaySight has already installed a total of 35 SmartCourts globally, including 19 in the United States. The Company has recently installed its first collegiate court at The University of Georgia, and is scheduled to install a more than 100 facilities in Florida, California, New York and at other locations around the world later this year. Sports Techie, PlaySight is an affordable proprietary ‘Smart Court’ technology. The Smart Court provides players with professional match statistics, analytics, line-calling and video – all in real-time or for after-action review – to enhance the tennis-playing experience and greatly improve training and coaching efficiency. The PlaySight product was originally developed from technology that the Israeli Air Force uses to train fighter pilots. The same type of motion and video can be applied to sport where there is action in a fixed area, with all the data being recorded in real time. The system at its core is the same, only they have come up with the way to make it affordable for the masses. The USTA now has access to a sports tech tool that can help bring back American superstars to the list of the world’s top ranked players. The USOC may want to study the sports science behind this expert system in order to help produce the next generation of Olympic caliber, Grand Slam winners. Juniors, recreational and elite players, as well as women, collegiate and high school programs will all benefit by implementing the PlaySight cameras that automatically tag events and provides real-time stats for analysis of tournament matches and practice time. It can also serve the solo sport players’ needs. The graphic interface is user-friendly, uses touchscreen technology and displays a Match Mode that details time played, fastest serve and distance covered. “Expand” the event list, use different camera angles and view where ball contact on the racket occurs. Every match can record a player’s speed of serve, ground strokes and calories burned. The telestrator tools have drawing tools like lines and angles that makes for better coaching communication with youth who live in a digital world or beginners who learn best from the visual references. It has no sensors and is easy to set up. Press “Debrief” and more serve, stroke and rally stats are available for diagnosis. If you want to improve on unforced errors, you can do it in just a few training sessions Video replay is synched with data points for easy understanding. The line-calling system alone is worth the price of the solution.